The first Kendo Dojo in Australia had begun circa 1963 with Mr Jim Paterson. It must be pointed out however that Mr Paterson was primarily a student of Karate, and like many persons in the wider martial arts world he appears to have “incorporated” Kendo into his training regime. What evolved was very much a hodge podge of techniques derived from books, as there was no bonafide Kendo Sensei in Sydney at that time. Indeed, the main Japanese martial art in Australia during that period was Kodokan Judo, Karate was just beginning to appear in the form of ryuha such as Goju Kai, Shotokan and Kyokushinkai. Into this Melbourne scene came John Butler. On May 4th 1966 John landed in Melbourne as a new immigrant from Great Britain. Born in London, England in 1936 John’s interest in Kendo began in 1959 when he played host to Saburo Matsushita, a visiting Judo champion from Tokyo. From Matsushita’s discussions about Kendo John and a few other Judo ka became interested and a small group of Kendo enthusiasts began training at the South London Judo Society. Members in this group included Roald Knutsen and Jock Hocking. 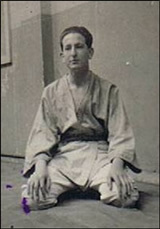 John’s first instructor was Squadron Leader R.A. Lidstone who had achieved Shodan in the 1920’s when he was part of the British Delegation in Japan. Consequently John’s first Kendo experiences included the throwing and combat waza that have today been “refined” out of typical modern Kendo training. Coincidentally Mr Lidstone also authored the book on Kendo used by Rex Lawley in 1960. By the time of his arrival in Melbourne John had played a role in establishing London’s Shinto Ryu Kendo Club and the British Kendo Association. He held at that time the rank of Ikkyu. Unfortunately John had left all his shinai and bogu behind, believing he could not bring bamboo items into the country. Despite an intensive search on arrival he found no established Kendo clubs and no interest from the various martial arts clubs in Melbourne in trying his “new” martial art. For John a short reward in his quest came in the return to Melbourne by Ex U.S. Marine Don Draeger, early in 1967. Regarded as the western world’s foremost scholar of Japanese martial arts, Draeger at that time had authored numerous books in his pursuit of a doctorate in hoplology (the science of weapons) and held the ranks of 6th Dan in Shotokan Karate, 5th Dan in Judo and 5th Dan in Kendo, among others. He had visited Melbourne in 1965 and given instruction for 4 – 6 months. On this occasion Draeger Sensei was brought to Melbourne by Paul Anderson who ran a dojo in Elizabeth Street. Being the only Kendo student of many who wanted the benefit of Draeger’s instruction, John had to settle for tuition in Kenjutsu and Judo during this time as neither he nor Draeger had bogu with them. Another important person to emerge at this time was Bill Freeman, who studied Iaido and Kenjutsu under Draeger Sensei during this period. Bill and John formed a great friendship and worked together in their mutual interest in learning and promoting interest in Japanese sword arts. In February 1967 Paul Guerillot immigrated from France and settled in Melbourne. Paul was a Karate student with a passion for Kendo. He was to later establish Victoria’s first Kendo club. The next decade was to prove more interesting and satisfying in terms of growth for Victoria, but the road was to be long and slow. (3.) This highly popular show drew its star, Koichi Ose who played the role of “Shintaro” to Sydney for a number of live performances in 1965. Two members of Jim Paterson club, (including Jim) Rex Lawley and Ron Bennett were drafted to play Shintaro’s arch villains, the Koga Ninja for the shows. Rex and Ron both toured Sydney and Melbourne and thus increased their interest in Japanese swordsmanship. Both these gentlemen were to play major roles in Kendo’s development in N.S.W. and Australia. (4.) Conversely in N.S.W. things were happening. In 1968 Mr Hori from the Consul General’s office wrote to Rex with news that a suitable Kendo teacher had been found. In a meeting in Mr Hori’s office Rex met Mr Yoshida, Principal of a Japanese school at French Forest in Sydney. Together with another teacher, Mr Shoji they began teaching at a dojo in Canely Vale before moving to another in Muirfield. The Sydney Kendo Renmei had been established. That same year Darryl Morris from England arrived to join the group. He proved to be a very dedicated Kendo student as did Steven Lawley, Rex’s son who began training. In 1969 Rex twice wrote to Japan to gain recognition of Kendo in Australia. With no response to his letters he asked Mr Yoshida to write on his behalf. In this he wrote of himself as President of the new Australian Kendo Renmei with Mr Rex Lawley as Vice President. They were immediately recognised by the International Kendo Federation (IKF). The AKR was established. In 1970 Rex Lawley and Darryl Morris attended the First World Kendo Championships in Kyoto, Japan as Australia’s sole representatives. Rex only competed in the Goodwill Tournament but won his division. At the grading he achieved 4th Dan.